In its latest Short-Term Energy Outlook (STEO), EIA expects the Henry Hub natural gas spot price to average $2.88 per million British thermal units (MMBtu) in 2018 and $2.92/MMBtu in 2019, slightly lower than the 2017 average of $2.99/MMBtu. Lower prices in 2018 and 2019 reflect EIA’s expectation of increased natural gas production and relatively flat consumption. The confidence interval range for natural gas prices shown in the figure above is a market-derived range that reflects trading in New York Mercantile Exchange (NYMEX) futures and options markets and is not directly dependent on EIA’s supply and demand estimates. The values for the upper confidence interval increase during the winter months compared with the rest of the year, reflecting the higher probability of an increase in natural gas consumption for space heating as a result of colder weather. EIA expects natural gas consumption will increase slightly in both 2018 and 2019. On an annual basis, EIA expects combined residential and commercial natural gas consumption to increase by 1.3 billion cubic feet per day (Bcf/d) in 2018 because of colder weather closer to the recent historical average after a very warm early 2017, then remain nearly the same in 2019. In 2018, the STEO forecasts increasing use of natural gas for electric power generation because of low natural gas prices. Natural gas-fired power generation is also expected to increase in 2019 because of growth in total electricity generation—fueled in part by increased natural gas-fired capacity—and anticipated coal-fired retirements. 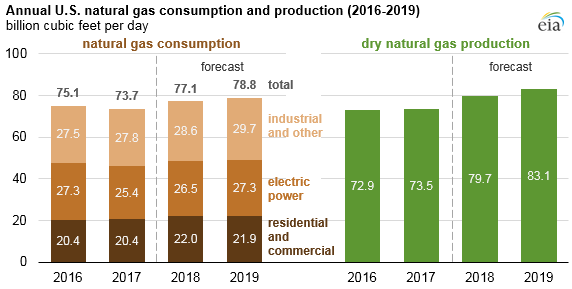 EIA forecasts dry natural gas production to increase in both 2018 and 2019, exceeding domestic consumption of natural gas for the first time since 1966. EIA projects production growth to be concentrated in Appalachia’s Marcellus and Utica regions and in the Permian region, where oil production results in associated natural gas production. Increasing pipeline takeaway capacity out of the Appalachia region, expected to increase by 8.4 Bcf/d by spring 2018, will deliver natural gas to end-use markets. Greater pipeline connectivity reduces spot market discounts to Henry Hub, the main price benchmark for natural gas, and is expected to result in higher wellhead natural gas prices and production growth. The United States became a net exporter of natural gas on an annual basis for the first time in 2017, with net exports averaging 0.4 Bcf/d. This trend is expected to continue, with net natural gas exports forecast to average 2.3 Bcf/d in 2018 and 4.6 Bcf/d in 2019. Most of the projected increase in U.S. natural gas exports is expected to come from exports of liquefied natural gas(LNG). EIA expects gross exports of LNG to average 3.0 Bcf/d in 2018 and 4.8 Bcf/d in 2019, up from 1.9 Bcf/d in 2017, as new export terminals in Maryland, Georgia, Texas, and Louisiana come online. Exports of natural gas by pipeline to Mexico are expected to increase by 0.6 Bcf/d and 0.8 Bcf/d in 2018 and 2019, respectively, with total pipeline exports averaging 8 Bcf/d in 2019. 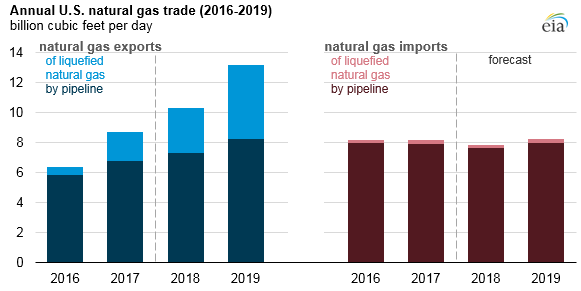 By 2019, exports of natural gas by pipeline slightly exceed imports of natural gas by pipeline.